27.10.1904: Launched by Cook, Welton & Gemmell, Beverley (Yd.No.63) for the Hellyer’s Steam Fishing Co Ltd, Hull as BASSANIO. 2.1.1905: Registered at Hull (H732). 1.1905: Completed (Charles Hellyer, manager). 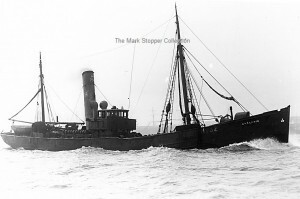 15.4.1913: Sold to The Imperial Steam Fishing Co Ltd, Hull (Owen S. Hellyer, manager). 8.1914: Requisitioned for war service as a minesweeper (1-12pdr) (Ad.No.309). Frank & Owen Hellyer appointed managers. Based Dover. 7.11.1917: Sold to John T. Barratt, Fleetwood (Joseph A. Taylor, manager). 6.1919: Sold to The Talbot Steam Trawling Co Ltd, Fleetwood (Joseph A. Taylor, manager). 3.7.1919: Registered at Fleetwood (FD207). 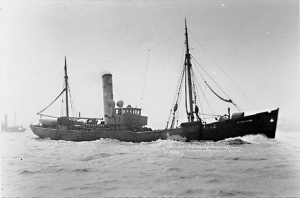 2.1927: Sold to The Neptune Steam Trawling Co Ltd, Hull (J. W. Storr, manager). 9.2.1927: Registered at Hull (H318). 1928: Sold to F. V. Vokes, Hull. 12.3.1928: Sold to Cyril Duggleby, Hull. 22.12.1931: Sold to Viking Steam Trawling Co Ltd, Hull. 1935: Sold for breaking up. This entry was posted in Steam Trawlers, Steamers (Picture) and tagged John T Barratt, Talbot STC on May 14, 2012 by Fred Smith.